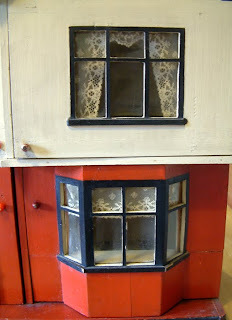 This is another gorgeous little dolls house that has just gone up for sale on KT Miniatures website. In fact, I have been torn whether to keep this or not as it is just delightful. However, sadly I just do not have the space so go it must! But if you are a lover of the 1930s era, then you will love this! It opens up at the front via four little doors, each with a tiny handle. The house appears to be in original condition and although obviously has been played with, the new owner can move straight in! 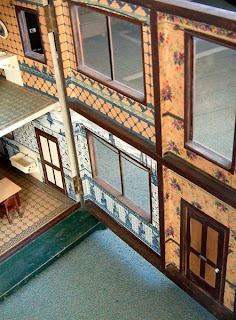 The ceiling height is high enough to allow 1/12th scale furniture, so this house may appeal to collectors of modern reproduction dolls houses as well as vintage collectors too? When I first saw this Tri-ang No. 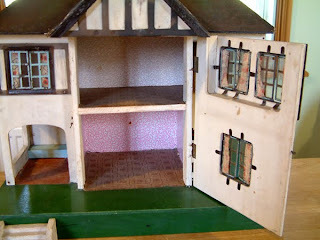 61 dolls house, I was immediately drawn to the very pretty pale blue windows which were unusual for this kind of model. With the dark brown metal frames to the windows I just assumed that it was prewar...however, the more I looked at it, realised that some aspects just didn't seem quite the norm. There is the pale blue bench for instance, which normally is seen on the earlier 1930's Tri-angs. Then of course there is that wallpaper, which is normally seen on later 1930s, early 1940s models plus the label...even though half torn off, can still make out that it is the one that was commonly seen from late 1930's to about 1956. However No 61's constructed during the late 1930's would normally have a window box under the downstairs window plus curved timbering, so I was curious as to why these were missing. Anyway, after consulting Marion Osborne, she too felt that this was manufactured either at the beginning of the war (Tri-ang continued to manufacture up until 1941 then had to cease) or maybe after the war in 1947, when Tri-ang started manufacturing again. Either way, this house has been constructed using old leftover components from the 1930's decade...obviously because when this was made, materials were drastically in short supply. So this makes this rather special. Personally, I think this is one of the prettiest No.61's I have seen, as the pale blue windows look extremely attractive against the dark frames. 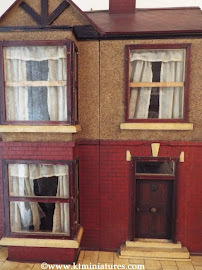 This house has now been put up for sale on KT Miniatures website. I have just returned from this wonderful event as a visitor (is nice to be on the other side of the table as just a buyer for a change)! 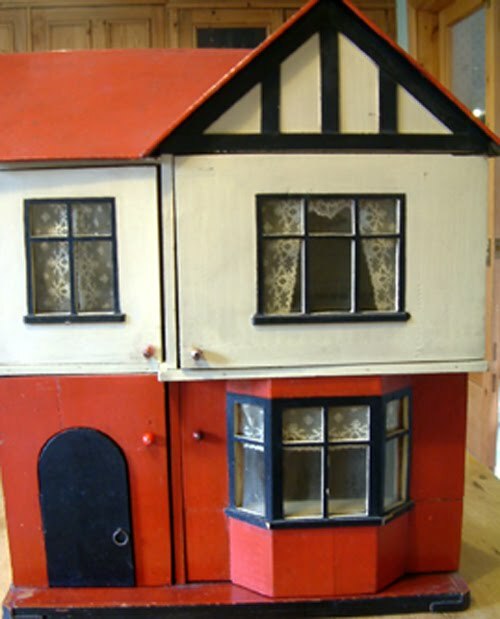 If you are a fan of antique and vintage dolls houses, you will simply love this event. This was the first time I had been to this particular fair and disappointed I was most definitely not. There were loads of tables literally overflowing with antique and vintage dolls house goodies of all descriptions for visitors to buy - the selection was breathtaking. 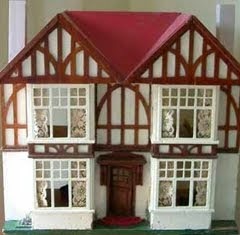 It just seemed that anyone who is anyone in the vintage dolls house world was there either selling or buying! It was great to catch up with old friends and meet new ones for the first time. Congratulations to the organiser for a lovely event! The next fair, I understand, will take place on Sunday June 27th 2010 at Cobham Village Hall, Lushington Drive, Cobham, Surrey KT11 2LU. 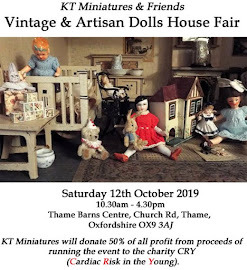 I can strongly recommend this event to anyone who collects antique and vintage dolls houses (plus old dolls and toys). 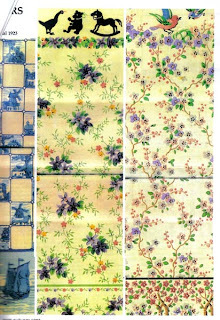 I have received a lovely letter from a lady from Hampshire concerning Bubby’s House with some extremely useful and fascinating details about the wallpapers inside. So “thank you” Isobel Hockey, for sending me photocopies of an article that appeared many years ago in that wonderful but sadly now obsolete magazine “International Dolls House News”. 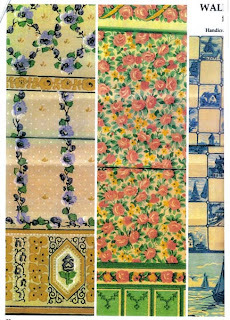 Although I had seen some of the “delft” style and tiled flooring papers used in Bubby’s House on several occasions in other dolls houses of the period, I had not seen any of the floral style wallpaper before. 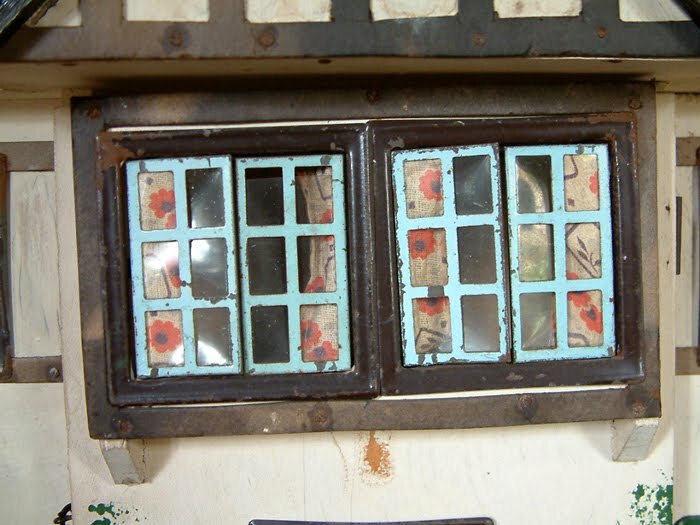 It seems that all of the papers used in Bubby’s House appeared in the “1923 Handicrafts Annual ” which were reproduced in part in an article for the Autumn Issue 1992 of IDHN. However these papers must have been available for a few years as Bubby’s House was constructed in the early 1930s. Isobel tells me that she has had a couple of old dolls houses with the floral and bird paper that appears in Bubby’s bedroom. I am now wondering if some of the components used on Bubby’s House, such as rainwater head, boot scraper/latch and even some of the metal furniture may also have been available from the same source? Ok..I have the FINAL TOTAL raised for Breast Cancer Campaign..an amazing £3,470.00!!! 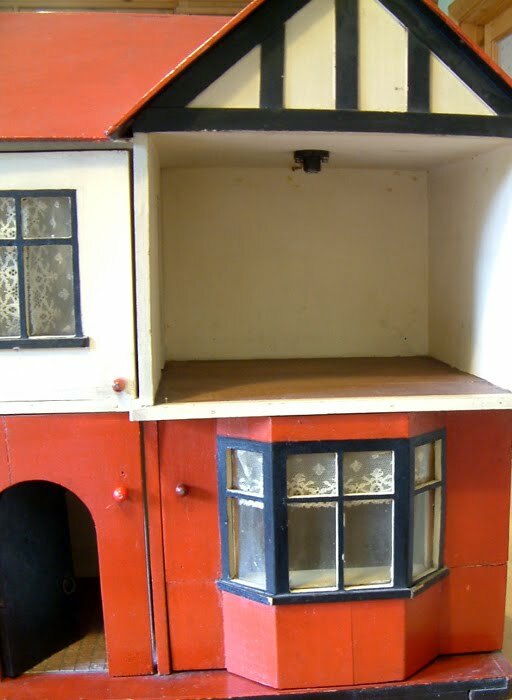 The money just kept coming in even days after Thame Dolls House & Miniatures Fair was over. The cheque is now being sent off to Breast Cancer Campaign and any money that comes in from now on, will be held over for next year’s fund raising “pot”. So once more…THANK YOU EVERYONE…your generosity has been astounding! This is the second book in my little Vintage Dolls House Series, and was released for sale for the very first time a few days ago at Thame Dolls House & Miniatures Fair 2010. 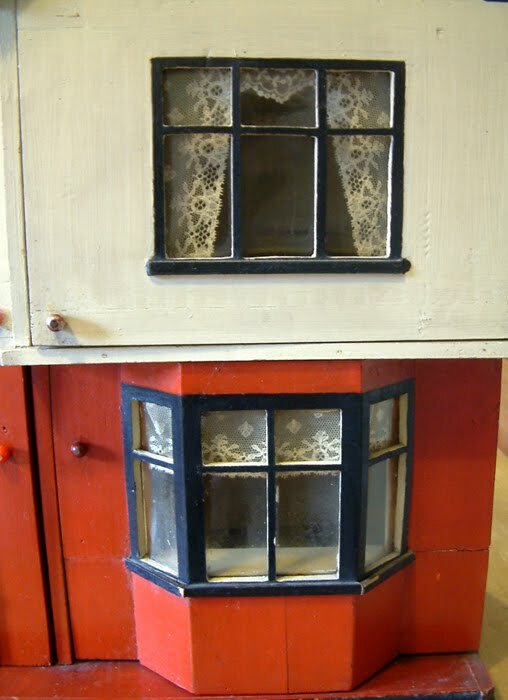 Priced at only £5.99 plus P&P, you will be able to read in detail all about Bubby’s House of course, plus I have included little extras such as instructions on how to make a 1930’s material lampshade similar to those found in this little house. For good measure I have added a whole section about my beloved little old 1930’s bungalow which sits up in my workroom and gives me much inspiration when I sit at my work bench! To conclude, I have inserted some ideas on how to integrate old and new dolls house miniatures together, for both collectors of vintage and modern dolls houses….have you ever thought about this? Will touch on this more over the next few weeks. 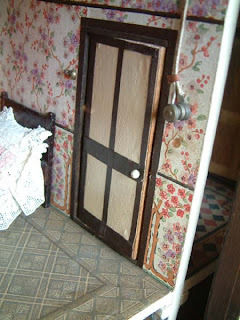 I have also introduced ideas with examples of how to use vintage items in miniature room scenes, extremely useful for putting broken miniatures to good use! 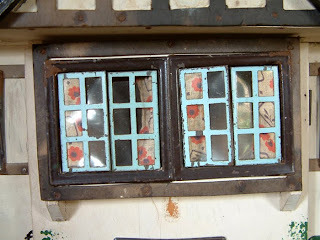 (See above a broken 1960’s Barton kitchen unit turned upside down, painted with metal handles added and now incorporated into an old workshop scene). 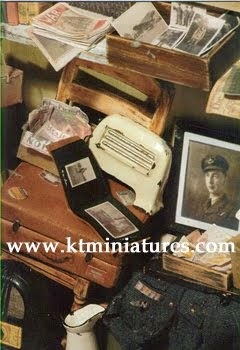 I hope you enjoy this little "journal" where not only will I bring you news of KT Miniatures products, but I will be able to "chat" a bit more freely on here than I can on my more formal "Latest KT Miniatures News" page that is on my website. Without further ado....lets get started!